The primary indication that anything actually did happen out here is a lone wooden sign, located on Rte. 96 in Kiowa County, before the purple mountain majesty of Pikes Peak appears on the horizon, on the plains of eastern Colorado, near the little town of Chivington. Another 30 miles up the road is a town named Kit Carson. The letters on the sign were engraved into the board and then painted, as if the donors couldn't afford stone and were old enough to know they might not be around to repaint it. This photo was taken in 1996, a decade after the sign had been erected, and it has already weathered quite a bit. Along with the small red grave stone shown in the previous picture, these were the only two historical markers indicating that there was anything which ever happened at Sand Creek that might be worth remembering. The lack of any national monument here actually surprised me. It gives one the feeling that as a people, we are still not ready to consider the truth of what has happened and what continues to happen in various parts of the globe. If we are to learn anything from these tragedies, we have to do what we can to understand each other better, and that includes looking into the truth of recent history. The site itself is still on private land and undeveloped, which is probably best for now, all things considered. But I think a descriptive monument on land nearby would be appropriate to honor the sacrifice of the fallen. Every little town down south has their Johnny Reb statue in the main square, and his cause was questionable; why not a monument to the innocent women and children who sought refuge with the US Government and were betrayed? Their story is especially tragic amongst the casualties in the great movement toward peaceful coexistence. Did they not lose their lives in the spirit of peace, trust and cooperation? Their story is worth remembering. In considering the struggle for consciousness and free existence on Turtle Island, the Sand Creek site is a very potent place for meditation and reflection. November 29, 1864, was an unforgettable day for the Cheyenne and Arapaho. 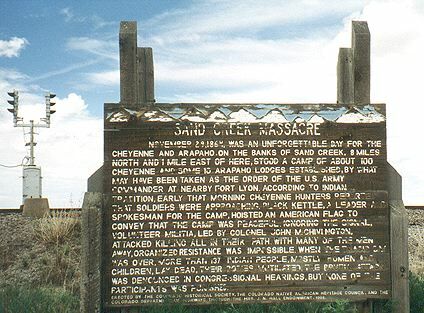 On the banks of Sand Creeek, 8 miles north and 1 miles east of here, stood a camp of about 100 Cheyenne and some 10 Arapaho lodges established, by what may have been taken as the order of the U.S. Army Commander at nearby Fort Lyon. According to Indian tradition, early that morning Cheyenne hunters reported that soldiers were approaching. Black Kettle, a leader and spokesman for the camp, hoisted an American Flag to convey that the camp was peaceful. Ignoring the signal, volunteer militia, led by Colonel John M. Chivington, attacked killing all in their path. With many of the men away, organized resistance was impossible. When the tragic day was over, more than 137 Indian people, mostly women and children, lay dead, their bodies mutilated. The brutal attack was denounced in congressional hearings, but none of the participants was punished.